Anna Bolton | Greene County News Wright-Patterson Air Force Base military personnel, civilian employees and their families run to the finish line Sept. 11 during the annual Run for the Fallen on base. At the finish, participants received American flag dog tags. 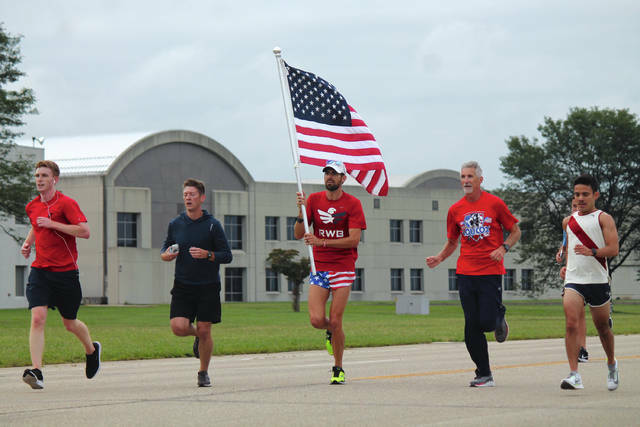 WRIGHT-PATTERSON AIR FORCE BASE — The WPAFB community remembered the men and women who died in the Sept. 11, 2001 terrorist attacks through its fifth annual Run for the Fallen. 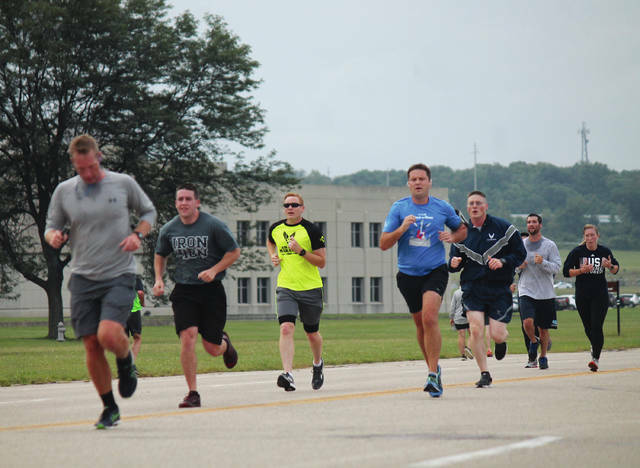 The 5K run and 1-mile walk began at 8 a.m. on the base, where nearly 1,000 military and civilian employees and their families participated in the event. Some dressed in patriotic colors, others with Air Force emblems on their clothes, another running with a flag held high. 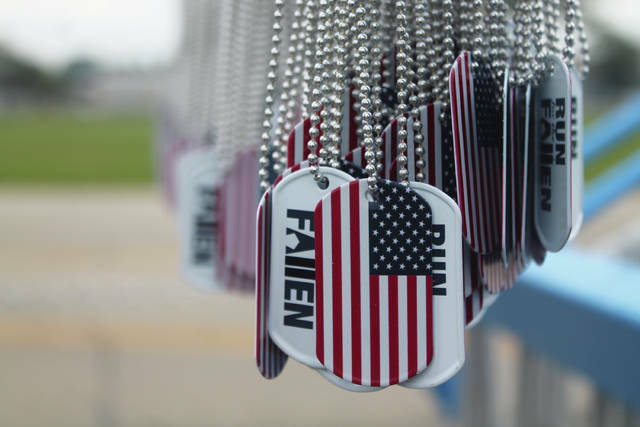 Each received a Remember the Fallen dog tag at the finish line. Lt. Odis Tucci, who organized the run this year, said the event is a collective effort, done in part by captains and lieutenants, along with fire personnel, medics and security working behind-the-scenes. Prior to the start, participants took moments to reflect on specific times from that morning in 2001.
https://www.fairborndailyherald.com/wp-content/uploads/sites/50/2018/09/web1_FlagRunner.jpgAnna Bolton | Greene County News Wright-Patterson Air Force Base military personnel, civilian employees and their families run to the finish line Sept. 11 during the annual Run for the Fallen on base. At the finish, participants received American flag dog tags. 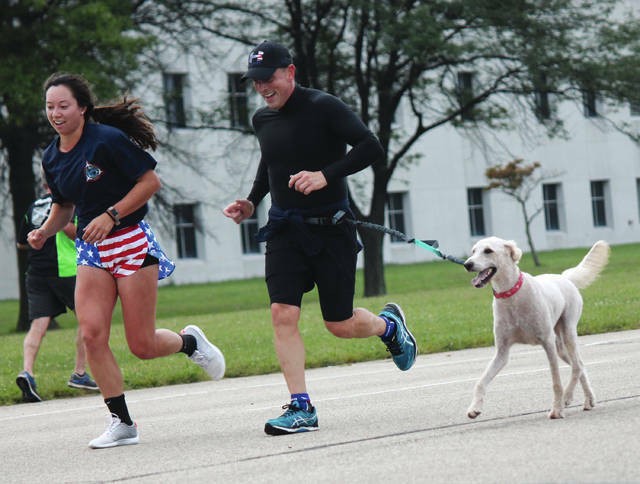 https://www.fairborndailyherald.com/wp-content/uploads/sites/50/2018/09/web1_RunnersDog.jpgAnna Bolton | Greene County News Wright-Patterson Air Force Base military personnel, civilian employees and their families run to the finish line Sept. 11 during the annual Run for the Fallen on base. At the finish, participants received American flag dog tags. https://www.fairborndailyherald.com/wp-content/uploads/sites/50/2018/09/web1_DogTags.jpgAnna Bolton | Greene County News Wright-Patterson Air Force Base military personnel, civilian employees and their families run to the finish line Sept. 11 during the annual Run for the Fallen on base. At the finish, participants received American flag dog tags. https://www.fairborndailyherald.com/wp-content/uploads/sites/50/2018/09/web1_MoreRunners.jpgAnna Bolton | Greene County News Wright-Patterson Air Force Base military personnel, civilian employees and their families run to the finish line Sept. 11 during the annual Run for the Fallen on base. At the finish, participants received American flag dog tags.